1. Simply cook chips as per instructions on back of the packet until they’re lovely, crisp and light golden. 2. Meanwhile, heat a large pan over a medium heat, and add chorizo, onion and garlic. Cook, stirring for 10-15 minutes or until onion has softened, and chorizo is crispy. 3. Once chorizo mixture is cooked place into a bowl and return pan to a low heat. 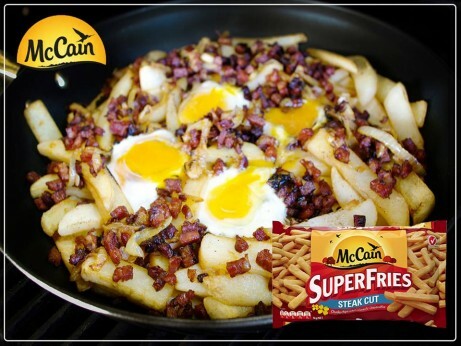 Add cooked McCain SuperFries Steakcut Chips, top with chorizo mixture and create four small wells for the eggs. Crack the eggs into the wells and cook until desired firmness. 4. Remove pan from heat, cut yolks and serve immediately. 1 Simply cook chips as per instructions on back of the packet until they’re lovely, crisp and light golden. 2 Meanwhile, heat a large pan over a medium heat, and add chorizo, onion and garlic. Cook, stirring for 10-15 minutes or until onion has softened, and chorizo is crispy. 3 Once chorizo mixture is cooked place into a bowl and return pan to a low heat. Add cooked McCain SuperFries Steakcut Chips, top with chorizo mixture and create four small wells for the eggs. Crack the eggs into the wells and cook until desired firmness. 4 Remove pan from heat, cut yolks and serve immediately.